You’re likely aware of the dangers of food poisoning from bacteria, but have you heard about aflatoxins? Aflatoxins are chemicals created by certain food molds of the genus Aspergillus. They are toxic byproducts from the normal metabolism of the molds. It’s possible for these molds to grow on many different types of foods. Read on to find out the most common food culprits and how to prevent getting exposed to these dangerous compounds. How can aflatoxins affect your health? Humans and many other animals can be affected by aflatoxins. In fact, the first documented incident of serious harm was in 1960 when 100,000 turkeys and other farmed birds in the United Kingdom died from groundnut meal in the birds’ feed that was contaminated with aflatoxins. The effects of aflatoxins can be acute or chronic. Acute exposure to high levels can lead to necrosis and cirrhosis of the liver, hemorrhage, edema, altered digestion, as well as damage to the lungs, kidneys, brain and heart. Chronic exposure to aflatoxins is more likely. And the symptoms are more difficult to diagnose. They can include impaired immune function, poor nutrient absorption and malnutrition, jaundice, cirrhosis and chronic hepatitis. In extreme cases, aflatoxin poisoning can lead to death. One type of aflatoxin is a carcinogen that targets the liver in many animals and potentially humans. It’s estimated that ingestion of aflatoxin contaminated foods is one of the factors behind over 250,000 liver cancer deaths in China and Africa each year. What foods can be contaminated? The Aspergillus molds that produce aflatoxins grow best in hot, humid environments. This means they’re often found on crops from warmer regions of the world, such as southern areas of the United States. They can grow on crops in the field or in storage after harvesting. It’s also been proven that when cattle or other animals ingest aflatoxins in contaminated feed, the toxins can be present in their milk or meat. Keep in mind that aflatoxins are largely unaffected by heat. Cooking or other methods of preparation cannot be relied on to destroy them. That means products such as peanut butter or corn chips can be equally as contaminated as plain peanuts or corn. How can you prevent exposure to aflatoxins? Be picky. 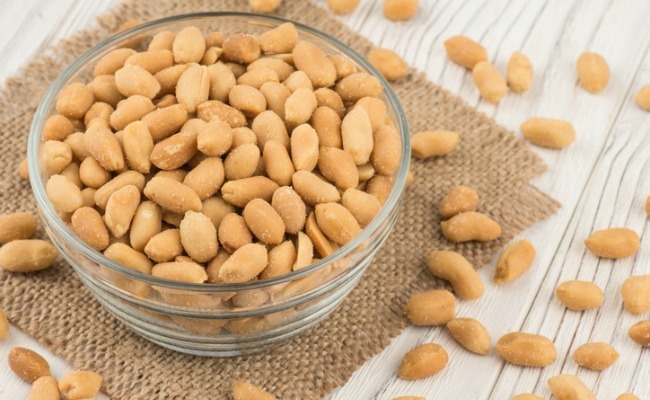 Don’t ever buy food that looks suspicious, such as shriveled beans and grains, discolored nuts or dried fruit that has any white or moldy-looking spots. Minimize storage. Only buy as much raw food products as you will consume quickly. Do not store food for any longer than about 1 to 2 months. Store properly. Keep any food storage spaces cool and dry to prevent mold growth. Freezing will also keep foods fresh. Buy local. Local products are often fresher than their imported counterparts. And it’s easier to speak to the farmers and producers yourself and ask about their agricultural and storage practices. Keep it fresh. If you’re buying commodities like rice and beans in bulk quantities, look for a company that ensures you’re getting the current year’s crop. It’s difficult to know how long foods in supermarkets’ bulk bins have been stored, so these are best avoided. Look for grass-fed animal products. Aflatoxins can infect animals through grain-based feeds. Meat and dairy products produced from grass-fed animals are more likely to be safe. Process effectively. Fermentation and sprouting have been shown to reduce the amount of aflatoxins in foods. Fermented bean and grain products like tempeh and miso are great options to make or buy. And it’s helpful to soak and sprout your beans and grains before cooking to help with digestion as well. Stay green. Chlorophyll, the compound that makes plants green, has been shown to reduce the absorption of aflatoxins. Chlorophyll is plentiful in all leafy green vegetables. You can get chlorophyll supplements as well. Eat your carrots. The Apiaceae family of vegetables has been found to inhibit the cancer-promoting activity of aflatoxins. This family includes carrots, parsnips, parsley, celery, celeriac, cilantro, anise, dill, fennel and lovage.